Below is my description of how I built this carbon fiber seat for my lowracer. I used the same form that I used to make the seat for my previous bike. This is a fiberglass prototype I made some time ago. 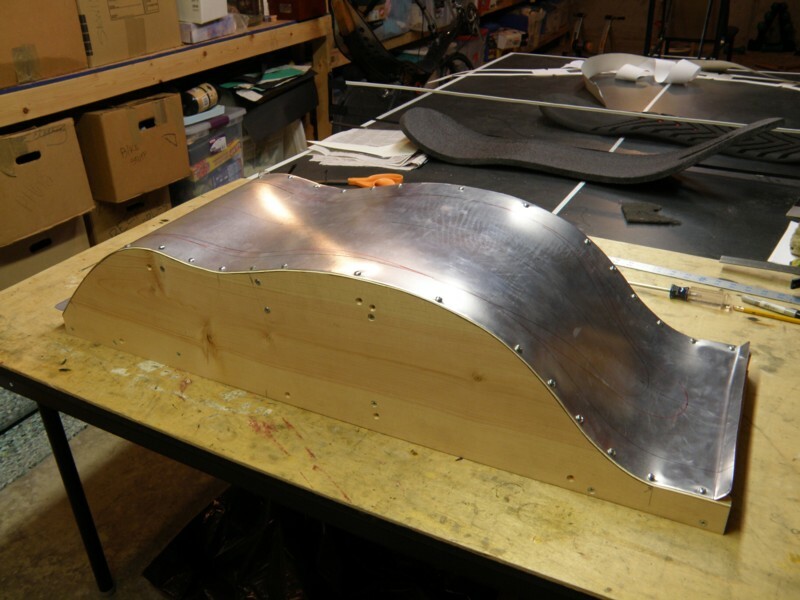 The process I used to make the new carbon seat was very similar to that for the fiberglass prototype. The prototype seat also turned out to be useful in an unexpected way, as shown in the picture below. Here I'm vacuum bagging what will become the front/top face of the seat. As in my previous work, I used a Foodsaver system for vacuum bagging. Inside the bag are two layers of 6k 8.9 oz plain weave carbon fiber fabric saturated with epoxy. I used West Systems 105 epoxy with 207 hardener. The carbon layers are sandwiched between a layer of 15 mil thick stiff plastic on one side, and peel-ply and batting on the other. The thick plastic sheet had two purposes: it provided enough stiffness for me to slide the carbon fabric sandwich into the bag. And secondly, it provided a very smooth surface for the carbon to cure against, which I hoped would result in a perfect surface finish for the face of the seat. After putting the sandwich into the bag, I draped it over the form, and held it in place by laying the fiberglass prototype seat over it and loading weights on top of that. Finally, I drew a vacuum on the bag and sealed it using the Foodsaver vacuum sealer. Above is the cured face of the seat after I removed it from the bag and stripped off the peel-ply and batting. Actually, it's more accurate to say that this shows the backside of the face layers of the seat. The true face of the seat is against the form. Next I made ribs for the seat using polystyrene insulation foam. I cut slits in the ribs to allow them to flex and conform to the profile of the seat. I used wood glue to adhere the foam ribs to the back side of the seat face, using anything and everything I could think of to hold them in place while the glue set. Next I put thickened epoxy (West Systems 410 microlight fairing filler) at the base of the ribs to make a filet from the rib to the carbon face. The purpose of the filet was to allow subsequent carbon layers to conform more easily to the ribs without wrinkles. I applied the thickened epoxy using a big syringe, then smoothed it with my finger tip. After it cured, I sanded the filet smooth. The cured filet was more difficult to sand than I expected, so I had to take care to avoid sanding gouges in the foam ribs. Then I added strips of carbon to the tops of the ribs. The strips actually consisted of two layers, one layer of 1 inch wide 4 oz plain weave "tape" plus one layer of 1 inch wide strips cut from the remainder of the 8.9 oz fabric that I had used for the face. In the image above, I'm applying peel-ply on top of the carbon strips. I cut slits into the edges of the peel-ply so that it would conform to the curved ribs and not create wrinkles in the carbon strips. Here I'm adding the batting before vacuum bagging. This shows the seat after curing the carbon strips in the vacuum bag. Next I added the first of two carbon layers over the entire back of the seat. For these layers I used an 11oz 6k twill weave, cut on the bias (45 degrees). Cutting on the bias allowed the twill weave to conform to the ribs. Somehow I convinced my wonderful wife to help me, which was good because it took some time to get the carbon fabric in place and properly smoothed over the ribs. Possibly, I could have applied and bagged both layers of carbon on the back in the same step. But applying carbon fabric is a race against the clock since the epoxy begins curing the moment you mix it with the hardener. So I opted to add only one layer at a time. Here's the seat after curing the first back layer of carbon and removing the batting and (most) of the peel-ply. The downside of slitting the peel-ply (to help it conform to the rounded ribs) is that lots of frayed threads get left behind. After removing all but the most stubborn of the peel-ply threads, I made pads where the seat would rest on the frame. These pads were not in my original plan. But when I test-fit the seat onto the lowracer frame, I noticed that the frame did not quite fit into the gap between the ribs. So I added the pads to lift the seat up a bit where the space between the ribs was bit wider. I made the pads using the same thickened epoxy mixture that I had used for the rib filets. Next I added the second layer of 11 oz twill weave carbon fabric over the back of the seat. 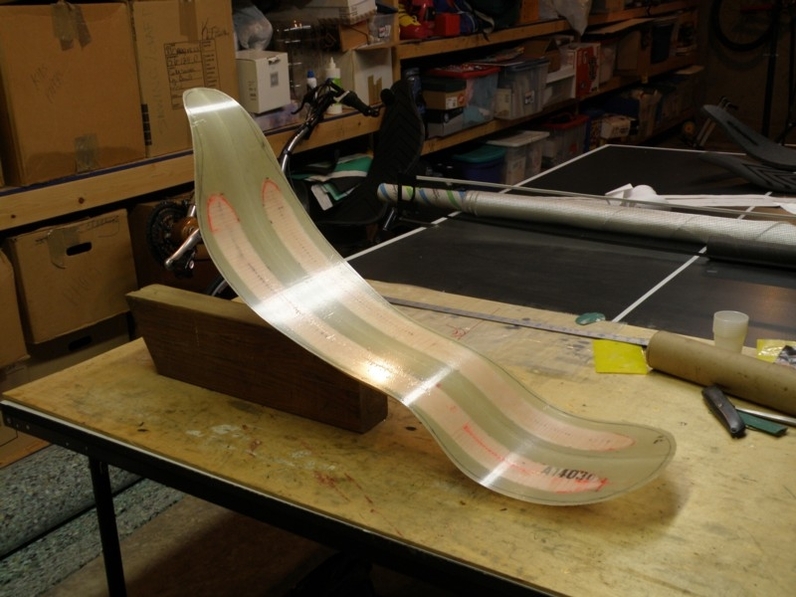 In this image, that final carbon layer is curing in the vacuum bag. And here it is after curing. Next I trimmed the perimeter of the seat. Finally it started to really look like a seat. The seat still didn't properly straddle the bike's frame, so I built up the mounting pads again with more filled epoxy. For some reason, I tried a different filler this time (West 404). I don't recall why I changed fillers, but it worked just fine. Here's a view of the face side of the seat. Here's another shot showing the face side. I drilled two sets of five holes through the mounting pads. It shows well the lumbar curve in the side profile of the seat. My impression is that my seats have more pronounced lumbar curve than most (any?) commercial seats. This feature helps cradle my pelvis and allows me to generate power without sliding up the seat. That's my theory, anyway. It wasn't necessary, but I decided to improve the surface finish on the face side of the seat. I painted a thin coat of epoxy to the face. Then I applied a sheet of smooth plastic over the epoxy and used a squeegee to smooth the film onto the surface and squeeze out the excess epoxy. This looks almost like the same picture, but actually here I have removed the plastic film after the epoxy cured. Along the edges of the seat you can see that some white printing from the film was transferred to the face of the seat. Oops. Otherwise, it looked pretty good I thought. Then came the most laborious part of the job, getting the pretty "3D" carbon finish appearance that I wanted. As usual, this required several iterations of applying epoxy and then wet sanding it. Here I coated the back with a thin layer of epoxy and put the seat back in the vacuum bag. While this creates some work to sand out the epoxy ridges wherever the bag had wrinkles, the areas between the wrinkles become smooth and requires fewer epoxy applications and less sanding than if I just let the epoxy cure without the bag. When I was finally tired of sanding, I applied a layer of wipe-on polyurethane to the surface. Finally, I mounted it on the bike!